The Gahanna Foundation was established, in July of 2018, as a charitable 501c3 not-for-profit. "The mission or purpose of The Gahanna Foundation is to raise funds through grants, gifts and endowments to fund projects directly or indirectly related to the Olde Gahanna Sanctuary and/or worthwhile neighborhood projects," according to IRS Form 1023ez. 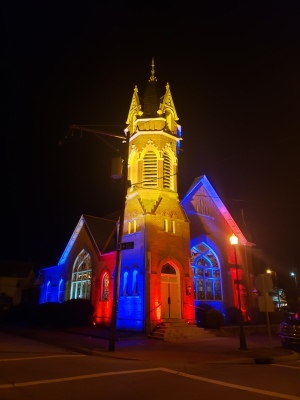 TGF's first bright idea is lighting the historic bell tower atop the Peace Lutheran church built in 1895. 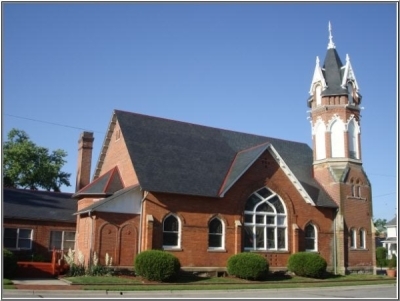 Located in the center of Olde Downtown Gahanna, at the 4-way stop intersection of Town and North High Streets, the tower is very visible. (Tower image below). Once Chris Apfelschtadt at Light Up Columbus installs a dozen LED lights whose color spectrum spans the rainbow, the long-dark tower will easily become a beacon of electric art that visitors, locals and tourists alike will want to see again and again.